Black and white photograph of 201 Byron Street South. 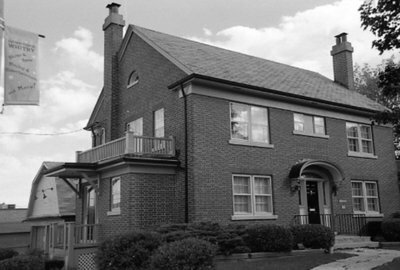 Dr. Frederick A. Cuddy practiced in Whitby for 49 years until he retired in December of 1980. His was the Medical Officer of Health and Coroner for Ontario County for 25 years as well as the Team Doctor for the 1958 Whitby Dunlops World Championship Hockey Team. He built his home on the empty lot located at 201 Byron Street South circa 1935. 201 Byron Street South, October 2005, Carl Ferencz. Whitby Archives A2013_016_007D.